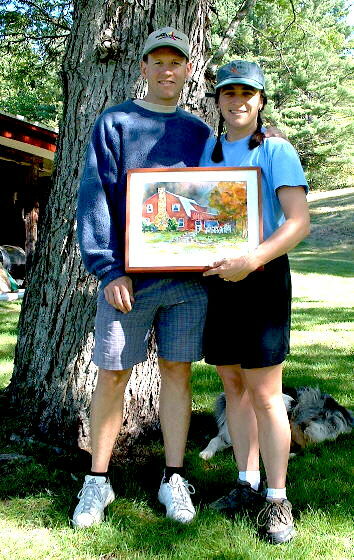 In 2002, Cindy Pierce, the youngest of the Pierce clan, and her husband Bruce Lingelbach bought the Inn from Cindy’s parents, Reggie and Nancy Pierce, and have carried on with the fine traditions of hosting great groups at Pierce’s Inn. They have enjoyed the innkeeping experience along with their three young children. Prior to innkeeping, Cindy was a ski coach, a teacher, and a stay at home mom. Bruce coached ski racing for 15 years, most recently at Dartmouth College. Below, Reggie and Nancy accept a surprise gift given by The Dartmouth College Great Class of '65. 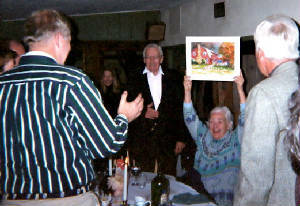 The gift is an oil of Pierce's Inn, which one can see better detail in the picture above, was painted by a Classmember of the 65s.